I'm excited to introduce our latest addition to our bean bag chair offering: Whimsical Woods! Spring is around the corner, and thanks to longer, sunnier days lately, I've been looking forward to my favorite season. So, when one of our fabric suppliers sent me a sample of this awesome new fabric for our bean bag chairs, I was thrilled. I bought every yard they had left and our seamstresses got busy making Whimsical Woods bean bags. Who doesn't love flowering trees, piggies, roosters, and don't forget the orange and blue sheep! The background is a pistachio green, which is a very hip color these days. This style comes in our best-selling 37 inch wide premium size, which is just great for kids and adults. Even your dear doggie would love cuddling in this chair...wait, is that a smile on Buster's face? And, of course, the cotton cover is totally removable so you can throw it in your regular washing machine to keep everything nice and clean. No one likes a dirty forest! You also get an inner liner that is water-repellant, so your filling is kept safely housed while the cover is in the wash. 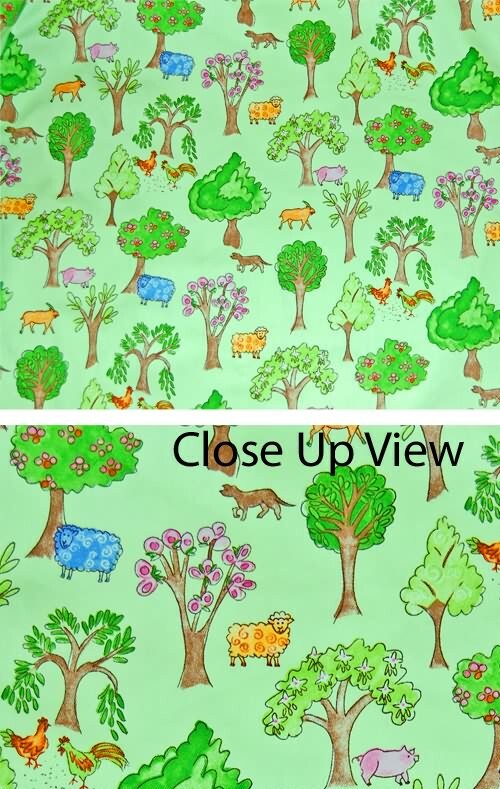 This style is a limited edition, since we cannot get anymore fabric to make more Whimsical Woods once they are sold out. So, hurry up and put some joyful fun into your home today!